It’s well understood you are viewing this page because you have questions that need answers, perhaps you want to upgrade, unbrick or unlock your Infinix device, Whatever your challenge may be so long as its software related, this tutorial will guide you through on how to write a new firmware on your device. I assure you there is Zero difficulty in flashing Infinix Phones, you don’t even need any prior technical background, all you require is a Laptop and fast internet connection for downloads. In a nutshell, Flashing is the process of installing an operating system on a Mobile phone. WHEN SHOULD I FLASH MY PHONE? UPDATE: When an updated firmware is released for your device, for instance, your infinix Hot 3 which runs Android 6.0 Marshmallow by default may get a Naugat update and you wish to upgrade. VIRUS INFECTION: If your Phone is always downloading files automatically, replicating or corrupting files etc. you may have to consider flashing it. FORGET SECURITY PASS: Though resetting by entering recovery mode could wipe security data, peradventure it does not work, you may have to resort to flashing the device. BRICKED: Just like electronic hardware, your smartphone software could also get bad thereby rendering the device useless know as “Soft or Hard Bricked”, In this condition, your phone would not show any sign of booting but don’t worry flashing it with another stock rom could restore it. BOOT LOOP: This is another booting related error but here the Phone may come up but won't boot beyond the Logo. When you see these signs I have mention don’t Panic just scroll down to learn more…..
• Ensure your device battery is at least 50% Charged. • Back up your Data on external storage device before you proceed to flash your Phone. • Make sure to download and flash the right firmware on your device, mistakes could be fatal. Take note of your device model and variant. • The USB cable you intend to connect ur device to the PC with must be original. • Flashing may void your warranty; contact your device manufacturer helpline to learn more. • You are about to follow this tutorial at your own risk. • When you have successfully downloaded SP Flash Tool, It will come as a compressed Zip file, next extract the Tool to any folder of your choice on your PC. • Extract and Install the MTK VCOM Driver you had downloaded earlier too. • Your Firmware is also in zip format so you need to extract it to a specific folder, name the folder after your phone Model. • Everything is in place; now locate your SP Flash Tool Folder and Launch SP Flash Tool as Administrator. • On the Top Right Corner of the Screen click on “Scatter _Loading” Button. 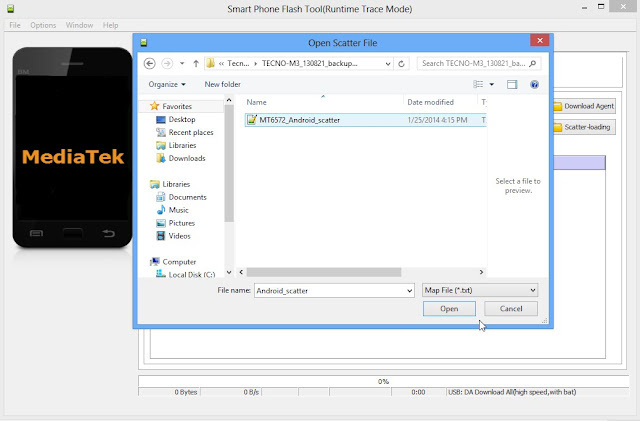 • Navigate to the Folder you had extracted your Firmware to and click on the Scatter File. • At the Top left corner of the screen Select Download Only. • Next Select the Partitions you wish to Flash. IMPORTANT NOTICE: Never select “PRELOADER” as part of the partition to be flashed. • Next Click the “DOWNLOAD” button. • Switch Off your Infinix Phone and Remove its Battery. • While the Battery is out, connect your Phone to your PC via USB Cable. • Now reinsert its Battery. • The Tool will detect your Phone and Flashing will commence automatically. • Be patient as it may take a couple of minutes to be complete. • when it's complete, Success alert comes in form of a green cycle with OK.
At this point, you can disconnect your Device and power it ON. Note That your device may take up to 15 minutes to Boot to Home Menu. • Replace the USB Cable you had used with a different one. • If your Device is not recognized by the computer, download and install another MTK VCOM driver. 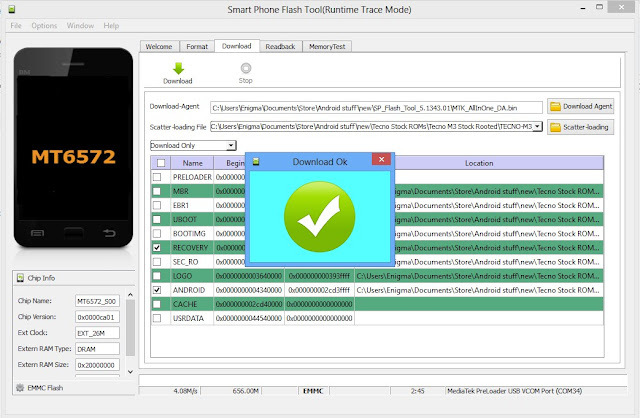 • Download and Flash your device with another firmware. (Do this if your device flashed successfully but not coming on). • If all of the above fails Service your Infinix Phone Motherboard and USB Port and Try again. Infinix Mobile also known as Infinix Mobility is a Chinese base Smartphone and Accessories Manufacturing Brand. It’s a subsidiary of Transsion Holdings (Other Brands Include Tecno and Itel Mobile), founded in 2012 its line of products like Infinix HOT, ZERO, S, and NOTE are available in over 30 countries Worldwide. The brand controls a huge market share in the Middle East and African countries like Morocco, Nigeria, Egypt etc. Infinix devices hardware is mostly powered by MTK (MediaTek) chips, which come in different capacity depending on the product Spec. while it Operating System is base on Google’s Android with a personalized UI called XOS. for more information visit Infinix.